The B-47 was the world’s first swept wing bomber and the first to use a bicycle arrangement landing gear, which was necessary because of the thin wings. It was also the first plane built solely for the delivery of nuclear weapons. The B-47 series aircraft were built by Boeing Aircraft Co., Douglas Aircraft Co., and Lockheed-Georgia Co. ; a total of 1,260 B-47s were built as bombers and 600 were built as trainers and reconnaissance aircraft. The B-47 first flew on December 17, 1947 and the first B-47A was delivered to the USAF in 1951. The RB-47H was an electronic reconnaissance and countermeasures version of the B-47E. It was built in response for the capability of countering enemy air defense systems. The first RB-47H entered service in August 1955 and the last was delivered in January 1957. This RB-47H S/N 53-4296 differed somewhat in equipment on board and carried six crewmembers. This particular aircraft served with the 55th Strategic Reconnaissance Wing at Forbes AFB, KS. And was the last operational RB-47 in the USAF; when flown to Davis Monthan AFB, AZ on 29 December 1967 for storage. It is being depicted as a B-47E bomber used during the 1950-1960s. 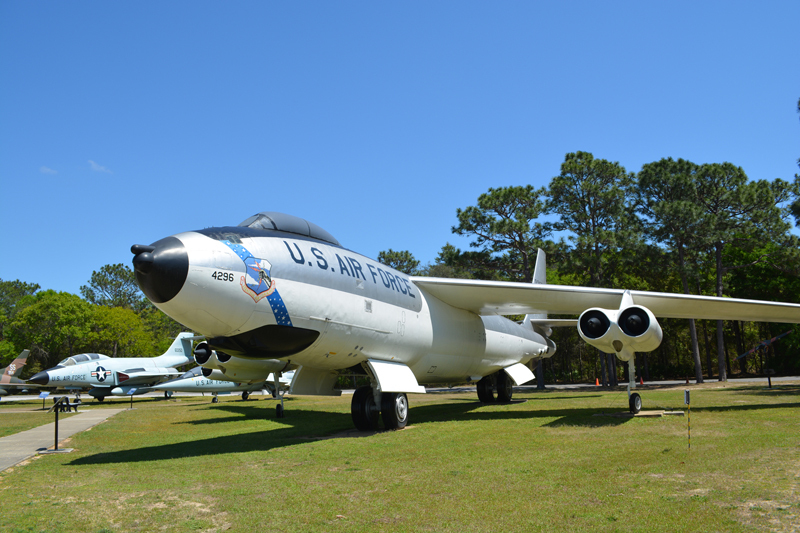 Item of interest – During the early days of Eglin Gulf Test Range, several B-47s were converted to target drones for the Bomarc Missile Program.